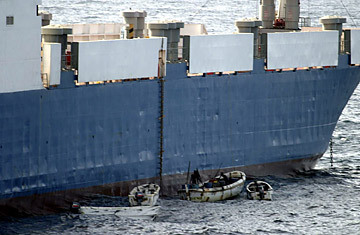 Will NATO Navies Stop Somali Pirates? U.S. Navy officials say the Sirius Star, whose maiden voyage was in March, had planned to avoid the Gulf of Aden altogether and sail around South Africa's Cape of Good Hope rather than through the Suez Canal Zone, as its owners wanted to avoid an encounter with the pirates. "That is the scary part," says Cyrus Mody, manager at the International Maritime Bureau. "What exactly are [the pirates] doing so far south? If they are thinking of expanding their sphere of operations to such great distance, it is going to become an absolutely humongous task to get this thing under control. It does suggest that they are increasing their capacity to stay out at sea for a much longer period of time. They can just sit and wait until a vessel comes along." The hijacking of the Sirius Star is also an embarrassment to NATO and the U.S., which had deployed naval vessels to protect shipping in the area in response to the recent uptick in attacks. According to the International Maritime Board, there have been some 80 pirate attacks off Somalia's coast this year. More than half of those were repelled, but the remainder have made for a highly lucrative year for Somali piracy. Once a ship is captured, the risk to crew and cargo of mounting a military raid to free it from pirate hands is considered too great  in most cases, the vessel's owners simply pay a ransom. Yet the threat of falling prey to pirates has not deterred shipping companies. Though some have changed their routes to avoid the Gulf of Aden, with the global economic downturn threatening to drive down demand for their services, they appear willing to risk the occasional ransom payment in order to stay in business. Nor are they transferring the cost to customers. Tony Mason, secretary-general of the London-based International Chamber of Shipping, says the pirate attacks have not pushed shipping rates significantly higher. As the piracy has grown, so have the ambitions of the pirates, who have begun to home in on tankers and bigger cargo vessels in the hopes of fetching larger ransom payments. Usually, a Somali pirate attack involves two or three speedboats, each carrying up to five armed men, but NATO officials say the number of boats involved is going up, suggesting that the pirates are getting more men and equipment. "Companies don't think twice about using security guards to protect their valuable facilities ashore," Gortney said. "Protecting valuable ships and their crews at sea is no different." Western military deployments are certainly having an impact in the area. Last weekend British marines attacked a Yemeni-flagged fishing vessel that had unsuccessfully attacked a Danish container ship. Eight pirates were arrested and turned over to the Kenyan authorities in what Britain's Armed Forces Minister Bob Ainsworth said was a "strong message to pirates that their activities are unacceptable and that the global community is united in its efforts to deter and disrupt them." But the British raid only underscored the difficulty facing international military efforts to police the shipping lanes of East Africa. The vessel attacked by the marines was nothing more than a rickety old fishing dhow, and the eight men arrested are likely to be quickly replaced by hundreds of other pirates  not to mention the thousands desperate to join their ranks and get a piece of the lucrative action. The pirates have thrived in a situation of negligible government authority on land, where the Somali state barely exists. And they are further emboldened by the jurisdictional difficulty of figuring out where to put arrested pirate suspects on trial. Strict rules of engagement also prevent foreign navies from attacking suspected pirate vessels unless they are caught carrying out a raid. That means that patrol boats can rarely interdict the pirate "mother ships" that ply international waters, directing the speedboats to their prey. "There is still a lack of direction from governments in terms of the rules of engagement," says Mody. "There is still a lack of procedure as to what would happen once the pirates are taken captive. We need a lot more robust action from the navies." Read a recent TIME magazine story on Somalia.